We had a case of some “severe” weather today in some areas. Hail dumped on my MARTA train around Buckhead station and I saw the poor passengers ducking for cover as the ice pellets came down. They had no choice; the train was going to pull away, so they just did it. I got lucky. Nary a few drops on my head. Some people did get a tornado in Cherokee County from what I’ve heard. The storm did injure one victim in my complex: the little floral sprout in the faucet I call “fighting flower.” Still, it’s gone through storms before and I know it will pull through. I think it’s fair to say that I’m entranced by it. This morning and evening, I tried to capture my impression of this tiny detail I pass by each day. You can see what happened in the following before and after pics. Shirley, you’ve heard about the tornado. The damage is slowly being cleaned up. 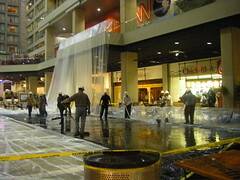 The photo at left is from when they were wiping up all the water inside the atrium when it rained the Monday after the storm. Vacuums and everything were implemented. Coincidentally, this all happened on pi day.